I had told my niece that I would fetch her when I found pens, ink, and paper left readie. I was not wholly truthful. First, I writ a page or two of my diurnal [journal]. Then, having nowt else to write of, I went to the kitchen for refreshments. There I saw my niece, sat bold-arst by the kitchen door. “What do you here?” I arrkst. 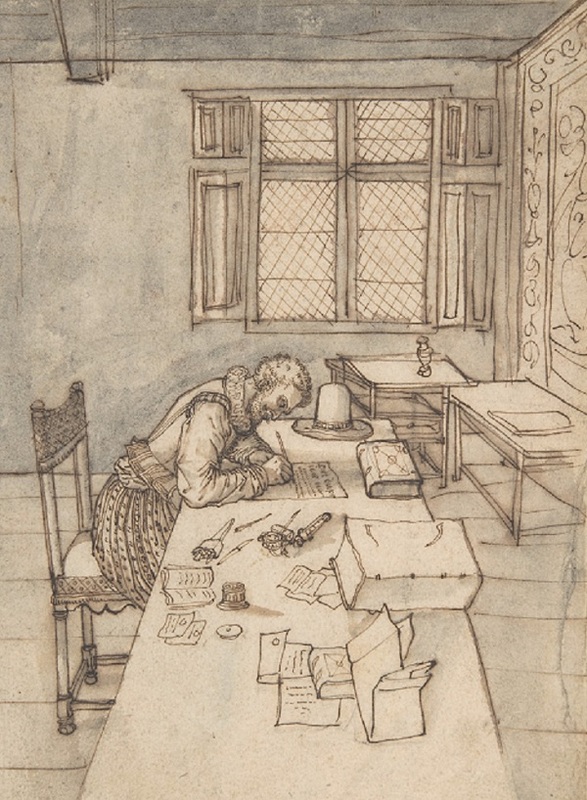 Cutting a quill – not a task for a cat. 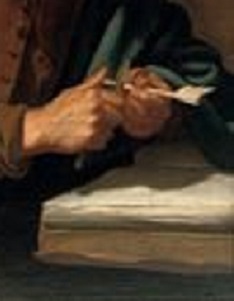 From Jan van Bijlert (c1597-1671) – St Luke the Evangelist. I led her to the book room where she arrkst more questions, too tedious to set down here. She sayt the pen was nowt but a feather, and feared the ink was poyson. I bore this with patience. Then I gave her a tap on the head, as my mother did when she wished me to take heed. I took the pen in my mouth, thrust it in the ink, seated myself as I would to cleanse my belly, and put the pen between my toes. I made the marks for Gib. Slow. I’m sorry I told her that, for she cannot conceive it. How else could I explain the sounds turned into marks that change to images in our mind’s eye? 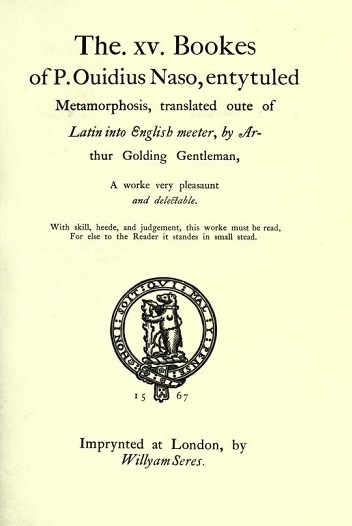 Arthur Golding’s translation of Ovid’s Metamorphosis – one of Gib’s sources for his tales. Metaphor, metamor, metamorphosis: one thing becomes another. Fit matter for a sonnet. But I fear I might confound myself. That cheered her, so I writ the marks for Bevis. A better name than Puss. Did you ever hear the like? I writ it fair. And then I told her to sit so I could put the pen between her toes. My little skoller [scholar] scratched a few. But she became so eager of writing Puss that she had not the patience to wait for me to dip the pen for her. She must attempt it herself, and splattered the ink. When I reproved her she struck the ink-holder a blow that knocked it from the table. Oh, she is suttle. I too am suttle, as was my lord when we were kits together. A quality most needful in young skollers. I’ve often wondered why Gib had such easy access to the library, books being the expensive items they were. He wrote of causing a certain amount of what we would call damage when he was living in a different household: Cowdray House, belonging to the young Earl of Southampton’s grandfather, Viscount Montague. The answer’s rats and mice who might have chewed the books. An even more expensive problem in the days before books were printed. Check out this delightful post on medieval cats with literary aspirations and notions of ownership.